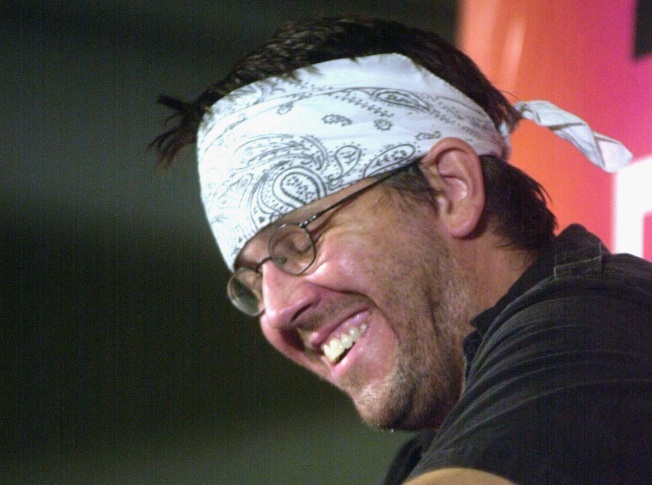 David Foster Wallace reading selections of his writing during the New Yorker Magazine Festival in New York September 27, 2002. Where to begin with the New Yorker's excerpt of an unfinished novel by David Foster Wallace titled "The Pale King"? Sure the discovery and publication is exciting for lit geeks and DFW fans everywhere. But then there is the matter of the alarming portrait that accompanies the story in the magazine. In it, DFW looks like a disturbing mash up of Axl Rose, Fred Durst and Riff Raff from "Rocky Horror Picture Show." You would think the magazine could have done better, but don't let it take take away from what might be the last we hear from one of the few truly original voices we had. Wallace was an undeniably great writer, and his suicide last year at the age of 46, an equally undeniably great loss. So his final (as far as the New Yorker knows) work, and its treatment, will be closely watched. The language in the excerpt is more spare than anything else he'd written, and, as the excellent introduction by D.T. Max points out, DFW has long struggled with his tendency toward linguistic histrionics (though many feel his packed sentenced were one his greatest gifts — he wrote as if he couldn't fit all his thoughts into them and they presented only the sharp edge of the what he fought to wedge into your consciousness once that had pierced the surface). Wallace characterized his first novel "Broom of the System" as sounding as if it could be the work of "a very smart 14-year-old" in a letter to his friend Jonathan Franzen. He derided his more verbose impulses as a "basically vapid urge to be avant-garde . . . and linguistically calisthenic." The new work, "The Pale King," recounts in stark scenes the lives of IRS workers in the Midwest (ohh, zeitgeisty), whose bleak existence DFW seems to want to match with his prose. There are worse ways to spend a snowy afternoon than digging into what amounts to a literary event (and the first one in the New Yorker in a long while), though hopefully you've already had your copy of the New Yorker home delivered, because the online version weighs in at an unwieldy 13 pages of scrolling.